The South Texas wind farm is expected to generate several hundred million dollars worth of revenue over the course of its life for the Kenedy Memorial Foundation, with money going to charities benefiting southern Texas, such as education and health care. John Calaway, the Chief Wind Development Officer at Babcock & Brown, grew up in windy Corpus Christi, Texas. Little did he know that several decades later he'd be bringing turbines to capture those winds and provide energy to thousands of homes. Knowing first-hand how windy it got in southeast Texas, Calaway was suspicious of the U.S. government's Class 3 classification of the area (sites with a Wind Power Class rating of 4 or higher are generally preferred for large-scale wind plants). So five years ago, to test his theory, Calaway went to the Kenedy Memorial Foundation in Corpus Christi to study the wind resource. The foundation is one of the largest philanthropies in south Texas, and its assets include massive holdings of ranchlands in the region. "We did a resource model assessment to look at the wind resources from Houston to the Mexican border. What we saw was that there was really a big bull's eye of wind speeds right at the Kenedy Ranch," says Calaway. "The higher wind speeds are really off shore, from Corpus Christi down to the Mexican border." The Kenedy Ranch was the ideal location for a wind farm. It includes 35,000 acres of barren mud flats-running from the Gulf of Mexico about nine miles inland-that allow higher speed wind to come further inland because there's nothing to slow its path. Babcock & Brown put up towers to determine the shear values and were delighted to find that the wind speeds at hub height were outstanding. Secondly, and more importantly, unlike west Texas, where wind kicks up in the middle of the night and during the spring shoulder months, the wind in this area of southeast Texas blows at a super peaking resource time, says Calaway. "At 5 and 6 o'clock in the evening, every single day, it's just blowing like crazy." Data demonstrated that turbines would be operating at approximately 60 percent capacity during peak hours. Because Texas has a clearing price every 15 minutes, this made the wind resource much more valuable. Simply put, electricity produced at 2 a.m. is much less valuable than electricity produced at 5 p.m. when usage is high. "Science drove the company to the location," says Calaway. "But when we saw the results, we knew if there was going to be a commercial wind resource in the Gulf of Mexico, or around the coast, this is where it should be." The Kenedy Ranch is the second largest ranch in Texas with about 400,000 acres divided into two sections: the Kenedy Trust and the Kenedy Memorial Foundation. Babcock & Brown was looking to put its turbines on the Kenedy Memorial Foundation. 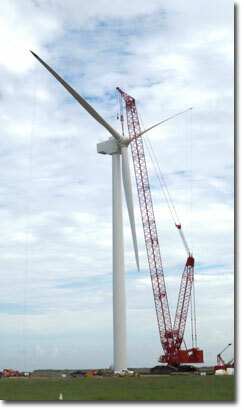 On the Kenedy Trust portion, Iberdrola Renewables was looking to place another set of wind turbines. Even though the two companies on the Kennedy Ranch are considered competitors, they had to work closely through environmental issues and lawsuits to bring wind power to the gulf. To prove wind energy was both commercially viable and environmentally friendly, Babcock & Brown spent several years proving its case through the use of innovative technology. First, to delineate the wetlands, the company surveyed the area with LIDAR (Light Detection and Ranging) technology-a remote sensing system used to collect topographic data. Babcock & Brown was able to determine how they could build the project-including 59 miles of access roads-without touching a single wetland. "It was tricky because it isn't wet here, like the Everglades," says Calaway. "There are just suppressions in the ground that can accumulate some water when it rains hard." The extra effort paid off. Not only were wetlands left untouched, but because all wetlands were avoided the company was also able to avoid federal permitting, and the extra delays it would cause to the project. One of the biggest hurdles Babcock & Brown ran into were lawsuits filed by other companies (with oil interests). They claimed that the turbines would kill migrating birds. The issue was that although a majority of the birds (over 95 percent) fly above the turbines during migration, if a storm front came in, it could exhaust the birds, potentially dropping them down into the path of the turbines. Babcock & Brown met that challenge head-on by installing an advanced avian radar system to study the birds. Unlike other studies, which may track migrations for a month or two in the spring to get a general idea of flying patterns, the company took it to the next level. Calaway. "So we measured our project radar for three years-seven days a week, 24 hours a day. My guess is that it's the best radar data-set that's ever been recorded over a wind energy project." To eliminate any potential bird/turbine collisions, Babcock & Brown first did the math to determine if they could "economically" shut down the turbines during those specific conditions. Seeing that they could, they developed cutting edge technology to handle the job. With the South Texas project's 118 turbines now generating electricity, Babcock & Brown is considering a phase two expansion, which would add 200 MW of generation with an additional 80 turbines. The company installed radar that constantly monitors for those particular stormy conditions. The moment the radar determines those specific conditions are present, an alarm is set off and the turbines are shut down within a minute of the signal. "We've been working with the Department of Fish and Wildlife on this and they're very excited," says Calaway. The lawsuits were dismissed in August 2008, and Babcock & Brown got busy building a wind farm, installing 118 turbines. 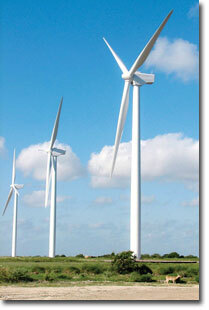 They started generating electricity in January 2009, generating enough renewable energy to power 80,000 Texas homes. Babcock & Brown installed 2.4 megawatt Mitsubishi turbines with 95-meter rotor blades, designed specifically to deal with typhoon or hurricane conditions. "They were developed in Japan and uniquely suited for our particular area," says Calaway. The project also required foundations be built with Gulf Coast storms in mind. "We built larger spread footings than normal for buoyancy. And there's a lot of protection for corrosion," says Calaway. Babcock & Brown is considering a phase two expansion in 2009, which would add 200 MW of generation with an additional 80 turbines. "Phase one is producing 283 megawatts," say Callaway. "Once we build phase two it'll be close to 500 megawatts. That, combined with the Iberdrola project, which joins us immediately to the north, will bring it to 900+ megawatts, which I think will be the biggest wind farm in the world." When the project is fully operational, the wind farm will generate several hundred million dollars worth of revenue over the course of its life for the Kenedy Memorial Foundation. All the monies will go to charities benefiting southern Texas, such as education and health care. "The Kenedy Memorial Foundation is one of the biggest contributors in South Texas," says Calaway. "So the partnership is a great thing for the people of South Texas." The development of the wind farm has also had a major impact on their economy. "Every hotel has been full for a year," says Calaway. "Between the two of us (Babcock and Iberdrola) we created approximately 700 jobs last year and those jobs will probably continue through this year as well. The local long-term jobs are probably closer to roughly 30 full-time positions. In fact, a new hotel was built in the area because there were just so many new workers that needed a place to stay." Babcock & Brown's partnership with Iberdrola, the next-door wind farm, will continue as they work together on the avian protection plan with the U.S. Fish and Wildlife Service. "I commend Iberdrola for an excellent field campaign, doing the point counts and everything on birds, and I think they would commend us tremendously on our innovative approach to radar technology. They've actually purchased the same radar and we're integrating both their data and our data. So we'll have a joint effort in post-construction monitoring, post-construction adaptive management, and the use of advanced radar, which are all interconnected. I'm excited about it." 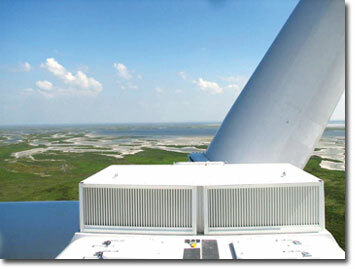 Babcock is hoping to see their radar technology used at other wind farms, and the company is currently using it in New York State. "I would think that we'll see a significant increase in the use of this technology," says Calaway. "It's the right thing to do-to find middle ground between people who are highly focused on birds and who might really want to have renewable energy, but they're struggling with the avian and bat impact. We have to find ways to relieve the stress." Calaway says he feels people need to move away from rhetoric and emotional decisions that aren't data driven. "We need to find a way for the government agencies and the NGOs (Non-Governmental Organizations) and the developers to have more trust. That's really where the problem is." And with Babcock & Brown's innovative system, it looks like a big step has been made toward building that trust.